Recently I was offered the opportunity to sample and review a new VikingCycle leather jacket from Motorcyclehouse.com. I decided it was indeed time for some hide in my motorcycle life again and being a fan of the classics chose the Angel Fire Motorcycle jacket. You know the style. Think Brando in ‘The Wild One’, The Ramones or even Schwarzenegger in ‘The Terminator’. The iconic biker jacket. If I’m going to wear another leather jacket on a bike it’s going to be the standard. Decision made. Many good motorcycle gloves to choose from. There are a ton of different motorcycle glove options out there for us to pick from, but what features make a good adventure or dual sport glove? I will break down some of the common features in motorcycle gloves and you can use this article as a guide to help you find a glove that suits your needs. The Held Evo Thrux is a well made glove that boasts many technical features. At the time this article was written the price for these gloves is about $130. These gloves are not cheap, but after a full season of riding they have proven to be a great addition to my glove collection. 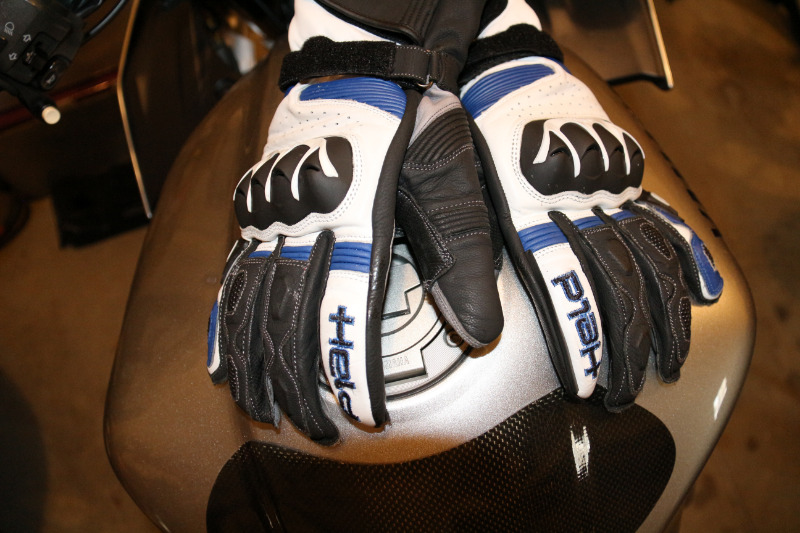 These gloves are equally at home on the street or the track.